An interview with Obama's paternal grandmother in Kenya and a check of citizenship and passport records in Indonesia should put this matter to rest....finally! 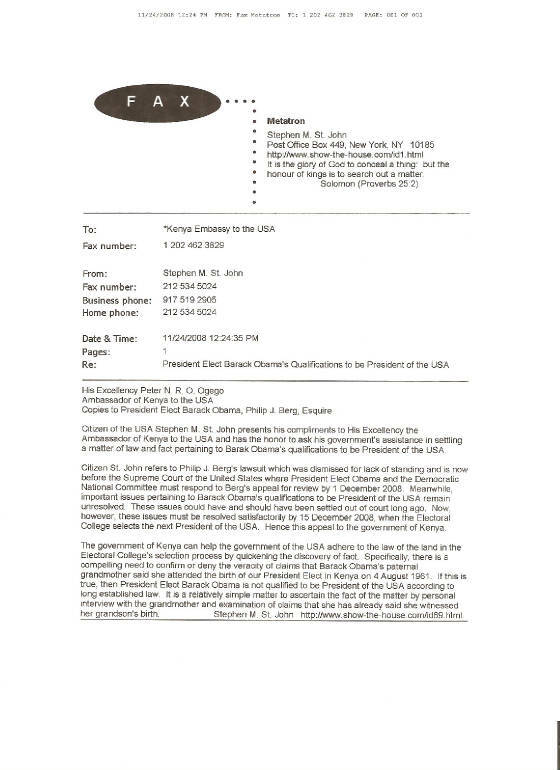 Citizen of the USA Stephen M. St. John presents his compliments to His Excellency the Ambassador of Kenya to the USA and has the honor to ask his government's assistance in settling a matter of law and fact pertaining to Barak Obama's qualifications to be President of the USA. Citizen St. John refers to Philip J. Berg's lawsuit which was dismissed for lack of standing and is now before the Supreme Court of the United States where President Elect Obama and the Democratic National Committee must respond to Berg's appeal for review by 1 December 2008. Meanwhile, important issues pertaining to Barack Obama's qualifications to be President of the USA remain unresolved. These issues could have and should have been settled out of court long ago. Now, however, these issues must be resolved satisfactorily by 15 December 2008, when the Electoral College selects the next President of the USA. Hence this appeal to the government of Kenya. The government of Kenya can help the government of the USA adhere to the law of the land in the Electoral College's selection process by quickening the discovery of fact. Specifically, there is a compelling need to confirm or deny the veracity of claims that Barack Obama's paternal grandmother said she attended the birth of our President Elect in Kenya on 4 August 1961. If this is true, then President Elect Barack Obama is not qualified to be President of the USA according to long established law. It is a relatively simple matter to ascertain the fact of the matter by personal interview with the grandmother and examination of claims that she has already said she witnessed her grandson's birth. Citizen of the USA Stephen M. St. John presents his compliments to His Excellency the Ambassador of Indonesia to the USA and has the honor to ask his government's assistance in settling a matter of law and fact pertaining to Barak Obama's qualifications to be US President. Citizen St. John refers to Philip J. Berg's lawsuit which was dismissed for lack of standing and is now before the Supreme Court of the United States where President Elect Obama and the Democratic National Committee must respond to Berg's appeal for review by 1 December 2008. Meanwhile, important issues pertaining to Barack Obama's qualifications to be President of the USA remain unresolved. These issues could have and should have been settled out of court long ago. Now, however, these issues must be resolved satisfactorily by 15 December 2008, when the Electoral College selects the next President of the USA. Hence this appeal to the government of Indonesia. The government of Indonesia can help the government of the USA adhere to the law of the land in the Electoral College's selection process by quickening the discovery of fact. Specifically, there is a compelling need to confirm or deny the veracity of claims that Barack Obama held Indonesian citizenship as a grammar school student named Barry Soetoro and in the early 1980s traveled in the Indian subcontinent on an Indonesian passport. If this is true, then President Elect Barack Obama is not qualified to be President of the USA according to long established law. It is a relatively simple matter to ascertain the fact of the matter by review of government records.